Eleven conversations taken from as many issues of Fata Morgana. Eleven conversations which synthesize the project behind the journal which was born in spring 2006. At the time it was decided against having an editorial comment because of the conviction that if the journal was going to succeed it would speak for itself. However, the time has come to say a few words. A journal is first and foremost a collective gesture whose outline creates a field. The gesture made by Fata Morgana, which at the beginning was only an intuition and then it slowly developed, is the same one that makes cinema a place and an opportunity to think about contemporaneity. It is not simply about what happens around us; it is what emerges from within the events which gather around a concept: from the concept of Bíos (issue No. 0) to the concept of the Sacred (issue No. 10). In this perspective, cinema needs to be interpreted and understood as having its own un-specific specificity. It needs to be interpreted and understood in its principal form where it is capable of categorizing its un-specificity, in other words, its autonomous form where it can categorize its heteronomy. This means thinking about a concept starting from cinema, and thinking about cinema starting from the concept. 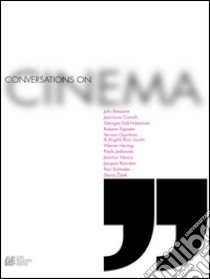 Thus, cinema becomes a special place and an opportunity to think about the universality of the concept (as a marker of contemporaneity) and the concept becomes the perspective from which to conceive cinema. By avoiding the double edged sword of a sterile specificity or of a self serving un-specificity cinema becomes the quintessential way of thinking about modernity where autonomy of aesthetical form is affirmed in its heteronomy, and its individuation imposes itself as a dis-individuation.